BROCKVILLE, ON — The Brockville Railway Tunnel is so old, its builders had to use gunpowder to blast through the bedrock — dynamite hadn’t been invented yet. Maybe that’s why it’s gone out of its way to catch up, technologically speaking. Melani and I parked in a gravel lot at the north end and walked a path that runs alongside the old track bed — a creek now, shadowed by wide old trees. At the end of the path, there is a heavy, ancient-looking wooden door left wide open. The large grey stones here, which make up the mouth of the tunnel were laid between 1854 and 1860 and they are rougher to the touch than they are to the eye. The tunnel is half a kilometre long, opening again at Brockville’s waterfront. It is the first railway tunnel that was built in Canada, and it was created using three different tunnelling methods — including using gunpowder. The Brockville & Ottawa Railway, which would eventually become the Canadian Pacific, connected industries at the edge of the St. Lawrence River with the rest of the Ottawa Valley — it ran from Brockville to Perth, Ont. And then there are the lights and music. LEDs run along narrow gutters on either side of the trackbed, making the walls glow red and green and blue and white in time with music pumped in from invisible speakers. We walked slowly along the path with the Tragically Hip and Kim Mitchell and their ilk as our soundtrack. Then, as we paused at a particularly perfect portion of flowstone, from behind us came the telltale metal clanging and wooo-wooo of a train. Our hearts skipped a beat — synchronized still — and a red light washed over us and peeled off down the tunnel. “Not cool, tunnel!” Melani half-yelled toward the light and I pressed my hand against my breastbone to make sure everything was still pumping as prescribed. It got us again on the walk back, somewhere underneath city hall, only it was so much worse because travelling north the red light in the shape of a train car was barrelling directly at us and the sound was that much more alarming when coming right at us. But this time we laughed, and hummed along with Patio Lanterns, and took our time returning to the car. 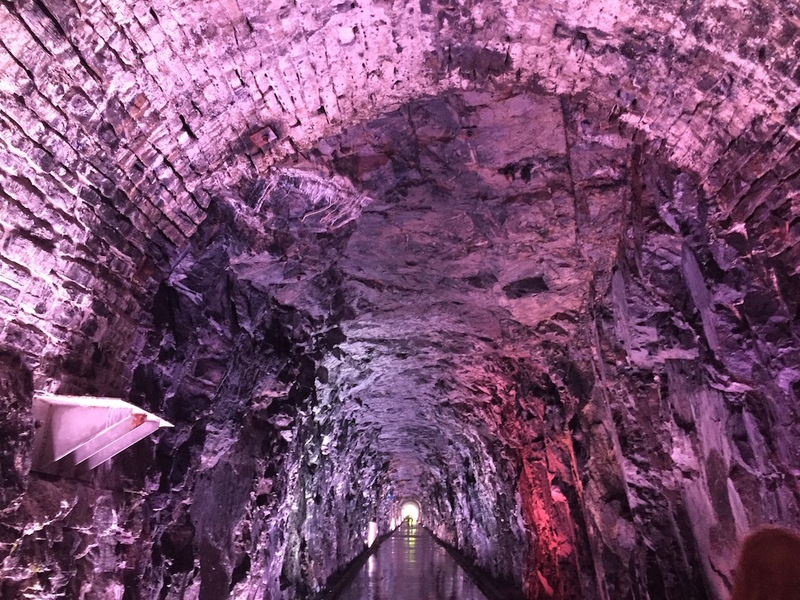 The Brockville Railway Tunnel was in use till 1969 and refurbished as a gift to the nation for Canada’s 150th birthday. The tunnel is fully accessible and has its own wifi and state-of-the-art sound system that pumps out music that is 90 per cent Canadian. It is open from 9 a.m. to 9 p.m. daily. Admission is free, but leave something in the donation box to keep this fabulous piece of Canadian history alive for many years.